The matrix mode of management is adopted in the research activities which provides devolved responsibilities for effective implementation of multidisciplinary/ interdisciplinary programmes. For administrative purposes the institute has identified three research divisions and two sections with strong support of central facilities and computerized administrative set up. 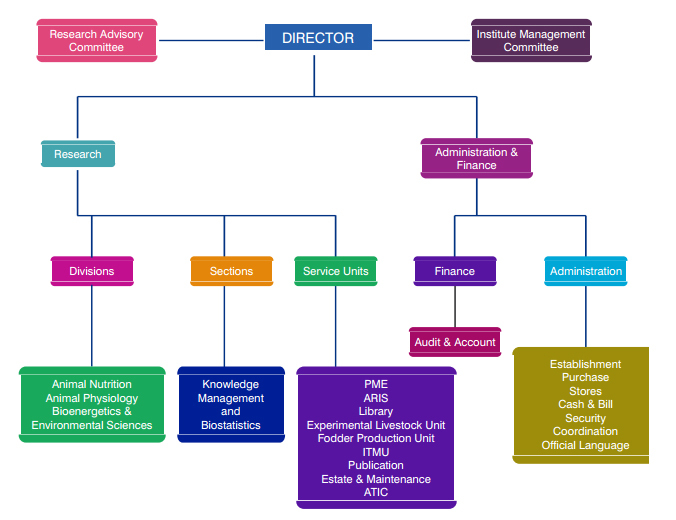 Director is the Head of the Institute supported by administrative and financial wings. To strengthen the local decision-making and research monitoring, Research Advisory Committee, Institute Management Committee and Institute Research Council play vital role through periodical meetings.